Sweet, salty, no-bake cookies that are perfect for the holidays! 1. Line a large baking sheet with wax paper. Place crackers on lined sheet, close together. 2. In a microwave safe bowl, heat caramel bits and water, stopping to stir every 20 seconds until smooth. Let cool slightly, then spoon into the center of a cracker and immediately top with a sprinkle of pecans. Repeat process, reheating caramel if it gets too thick to spoon out. 3. 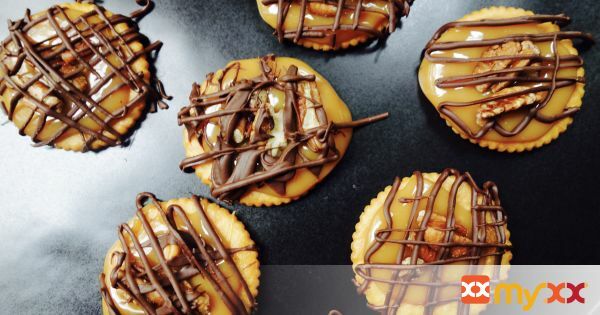 Allow caramel to cool on the crackers. Heat almond bark according to box directions, then drizzle or spoon over crackers. Let chocolate coating harden before serving.